“When you feel a connection, a gut connection, a heart connection, it’s a very special thing." Horses are emotional savants so they are masters and profound partners in human development. They are relational beings and it is through relationships that we get to see who we really are. Horses have the ability to illuminate who we are, how we are being as we are doing and where we need to go. They respond to us as unique individuals and somehow understand who we are at our deepest, most secret level - in our very hearts and souls, in doing so they accept us without judgment. An experience with Horse is a reflective learning journey into who and how you are being, how others see you, how aligned you are and your degree of coherence in showing up in the world. They are experts in teaching us the somatic awareness necessary to truly feel into the nuances of sensations that underlie our emotions and to learn to understand the messages from the body so we can connect with our heartfelt passion and compassion, our inherent creativity and ability to respond with wisdom and the courage to take, or not take, action. When humans interact with horses, there is often some magical sort of connection and resonance that happens. This we believe is a process that scientists have now actually named and it only occurs when we are in relationship, when allowing ourselves to be fully felt (and seen) by the other, along with fully sensing into ourselves. What others in the field observe, witness and sense during this process, is the creation of what has been termed, the limbic connection of two beings. This is related to neuro plasticity, the concept of 'therapeutic presence' and its role in healing in relationship. This connection and resonance affects the development of neural pathways in the brain through the processes of limbic resonance, limbic regulation and limbic revision or restructuring. I first read about this some years ago in Thomas Lewis, MD, Fari Amini, MD, & Richard Lannon excellent book, 'A General Theory of Love'. Some of the information in this book details how a therapist’s relationship with a client is the determining factor in long term growth and healing - being limbically known (limbic resonance) - and we believe that this can also be applied to how and why certain equine facilitated experiential processes (that encourage connection with self) in relationship can be so profound and powerful and thus a great catalyst for change . "Because our minds seek one another through limbic resonance, because our physiological rhythms answer to the call of limbic regulation, because we change each others’ brains through limbic revision—what we do inside relationships matters more than any other aspect of human life". Mirror neurons play a role in this and in society and cultural development through imitation and thus the process of learning and are an important part of feeling empathy when we are in connection. Limbic regulation happens through relational experiences and important limbic lessons are absorbed implicity as mammals grow up. Healthy beings evolve through their links and felt connection to each other and thus integrating the link between relationship, mind and brain. Many of us unfortunately do not grow up experiencing and developing these strong links and fewer have good mentors of Social and Emotional Intelligence. These skills, which include the concepts of emotional contagion and affect, emotional modulation, agility or resilience are not learnt at primary or secondary school like other cognitive or rote learnt subjects. (ie math, science = explicit learning stored in the neocortex). An equine experience with a skilled, coherent and congruent facilitator along with a horse can greatly aid in the implicit learning process. Daniel Siegel’s work and book 'Mindsight', also supports the efficacy of experience in relationship for growth and change. Mindsight is using our minds and experiences to shape our brains. It is what underlies mindfulness, emotional and social intelligence. 'Most people come into the world with the brain potential to develop mindsight, but the neural circuits that underlie it need experiences to develop properly and it is never too late to stimulate this growth'. His concept of “feeling felt” is what most people and horses desire to live exciting, meaningful and authentically evolving lives. 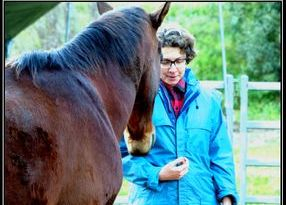 Equine facilitated learning can and does transform the client’s limbic brain which takes much more repetition than does the “quick fix” of brief therapies and trainings which address only the neocortical brain. The neocortical brain can rapidly change and process didactic information but without engaging the whole body along with the head, heart and gut; only ones’ thoughts and information undergo brief change. "The heart generates the largest electromagnetic field in the body. The electrical field as measured in an electrocardiogram (ECG) is about 60 times greater in amplitude than the brain waves recorded in an electroencephalogram (EEG)." HeartMath studies show this powerful electromagnetic field can be detected and measured several feet away from a person’s body and between two individuals in close proximity. Results of The Electricity of Touch experiment showed "when people touch or are in proximity, a transference of the electromagnetic energy produced by the heart occurs". Horses hearts can be up to 5 times larger and 7 times heavier than a human so there is a huge number of neural networks and thus transferance and resonance that occurs. Many 'therapy' practices "are based upon the assumption that an exchange of energy occurs to facilitate healing," according to the findings. The time has come for a new generation of coaching and leadership, time for humans to expand their learning. For evolution and transformation, the empahsis needs to be on cultivating oneself. This requires the development of embodied presence - a presence that is self generating, self healing and self educating. We believe that empathy, compassion and presencing skills are an important part of cultivating whole, authentic and self-generative leaders and coaches. The ability to be mindful and presence oneself and cultivate it in others is an essential element in human learning and development. Once a leader, coach or facilitator has mastered the inner moves of directing their attention, they are able to work on developing this in others for lasting, sustainable development and relationships. Part of this is learning to re-connect with the body and its felt senses. Sensory information travels from the body to the brain and influences how we respond to the world - yet this somatic awareness and training is commonly overlooked in personal development programs. Therefore cultivating one's felt senses, somatic and body centered awareness is an important element of our programs. Presence is a state of expanded awareness that brings one into a living relationship with a greater and larger reality and it is a deeply felt experience of timelessness. All this however has to be grounded through the body, through living deeply through our mind, body, heart and gut. Being and living from this place, we have more choices, a larger context from which to view our lives, new or even unlimited possibilities for action, longer moments of being 'awake' and increased levels of fulfillment, which we are then able to extend to others. The environment we work in, no matter where or what we do, can provide us opportunities to contribute positively to shifting the consciousness of individuals, teams, organisations and communities. Being prey animals, horses are masters of living in the present moment and states of expanded awareness and so are great teachers in this. They are highly sensitive to both body language and changes to energy in the environment - both qualities of great leadership. Through observing their reactions and responses to us, they help us to make the unconscious - our shadow or blind spots - conscious. Horses live in a state of 'mindful relaxed awareness' ready to sense any changes through their huge gut and heart. They sense the energy of an emotion, they get the message behind the emotion, they respond to it, then they go back to grazing. Unlike humans who feel the sensations of an emotion, then get stuck in the head, replaying old stories and doing too much thinking which takes them out of the present moment and takes attention away from feeling and experiencing. We then get caught up with analysing and judging or ignore, downplay, repress, suppress or dull the emotion and so never tune into the underlying emotion or message. If continually ignored, the messages from the body often have to get louder and louder and over time, often may manifest into illness before the head finally stops, takes notice, listens and is forced into making a change. We feel that being in the presence of horses -with their large heart and gut brains and even larger physical size - helps humans to be in a greater state of awareness, presence and coherence. We've found that simply being in the same space as a horse has a profound impact on people. Their naturally centered and grounded presence affects us when we enter their energetic field. We weren't sure why we were finding this until we discovered The Institute of Heartmath research into heart intelligence and found that their research into the heart field and coherhence greatly support our approach. When in this state, humans are able to see, feel and believe in the possibility that the deeply rutted habitual way of being and responding to a familiar person, stimulus, thought or action, can be replaced by a new path. At first it may be a very light deer path that is almost unseen, but with use grows wider and deeper. It is like the trail less traveled. Difficult to tread and follow until it is well worn. The multiple intelligence theory - we have neural networks that constitute a brain in the head, heart & gut - greatly supports the work with horses. small intestine being about 70 feet long and the colon 35 feet long, so that's a huge number of neural networks. Now that science has shown that intelligence is distributed throughout the body and we actually have 3 centers of intelligence - why aren't we learning about and using all 3? This proves the importance of education and training programs that develop the body mind connection and makes somatic or body centered awareness a crucial first step for re-connecting and drawing on our multiple intelligence for wisdom in leadership. When you have a direct felt experience, the sensory information travels from the body up to the brain and influences how we respond to the world. The first place it goes is to the neurological networks of the intestinal tract - the gut brain (when you get that 'gut feeling') and also to the heart brain (you have a heartfelt sense). This information plays a crucial role in how we respond to an event, yet this somatic awareness and training is commonly overlooked in personal, professional and leadership development programs. Stephen Porges is professor of psychiatry at the University of Illinois, Chicago, and director for that institution’s Brain-Body Center. He has spent much of his life searching for clues to the way the brain operates, and has developed what he has termed polyvagal theory. As Porge's vagal theory suggests, more information travels up the body from the gut and heart via the vagus nerve than what travels down from the head brain. The neural pathways that go through the vagus to the lower gut come from one area of the brain, while the neural pathways that go to the heart and to the lungs come from another area. Based on the theory, Porges and his colleagues have developed treatment techniques that can help people communicate better and relate better to others. Porges’ polyvagal theory is becoming an important part of the training of bodyworkers, therapists and body-centered psychotherapists, along with coaches, trainers and educators like us. Harnessing the power of your multiple brains allows you to communicate with, align and tap into your innate intelligence and wisdom. When you do so, you make wiser decisions and thus can transform the relationship with yourself, others and the world. Aligning and integrating your multi intelligence connects you with the values and compassion in your heart - seeking new experiences, passion and purpose and openness to new possibilities; the creative goals and planning processes from your head; and the courage to face your fears and act from your gut. We cannot live a connected, aligned and wise life listening and acting on just one. 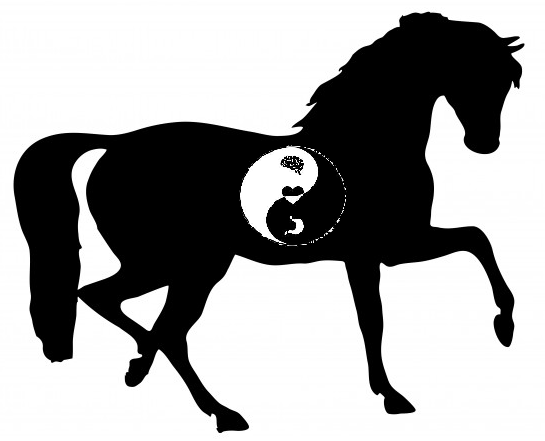 Just like horses, the brain in your gut “reads” and senses what others feel and somewhat unconsciously, measures the degree of coherence and congruence of the other’s feeling state. It then checks this state of the other against its own inner state of coherent values, beliefs and passions. Predators like humans can be pretty adept at hiding their emotions, feeling one thing inside and pretending another on the surface. Humans are often incongruent - smiling while the gut is churning and this may fool some people. However others often do get a sense that something is not quite right and may feel uneasy or angry when this incongruence is sensed, yet not know why they are feeling this way, unless they are really attuned to their internal state and can sense into what is theirs and what is the others. This is why the work with horses is so profound. Being prey animals, they are highly sensitive to emotional energy and are experts at attuning to the inner state of humans. They are able to 'check us out' for any incongruence, and authentically respond to us from their guts and hearts. As they have a small cortex, they do not respond so much from the head brain, (like humans often do) where thoughts and language can often distort and deny what is actually happening. According to anatomists and physiologists, humans have type A hearts and horses have type B. The findings are the cardiac electrical conduction systems of a stalking predator versus a flight animal, the latter having an enormous ability for the athletic first response that can take a horse's heart rate from resting to about 300 beats per minute coming out of a starting gate. The heart of the horse is structurally similar to humans with the same four chambers and heart valves. The differences lie in the ability to contract the cardiac muscle fibers by activating electrical stimulation, not in a linear highway of conduction (type A), but that of a conduction system that reverses direction at the same time as flowing forward.